CLIXs software, Implementation of CLIXs, School Computer Lab Readiness Drive, CLIXs programme, ICT uses in teaching learning process: Implement the CLIXs programme in all the schools in the above districts . The Teachers have been trained along with MIS Coordinators. The implementation of CLIXs i.e., integration of ICT in teaching learning process requires functioning of computer labs in the schools. Sub:- RMSA, Hyderabad - Implementation of CLIXs - School computer lab readiness drive in 13 districts with team from CLIXs (TISS) and MIS coordinators from 21.07.2017 to 30.08.2017 - Orders issued- Reg. The District Educational Officers of Karimnagar, Jagityal, Peddapally, Siricilla, Siddipet, Warangal (Rural), Warangal (Urban), Bhoopalapally, Jangoan, Mahabubabad, Ranga Reddy, Medchal and Vikarabad are hereby informed that it is high time to implement the CLIXs programme in all the schools in the above districts . The Teachers have been trained along with MIS Coordinators. The implementation of CLIXs i.e., integration of ICT in teaching learning process requires functioning of computer labs in the schools. Several instructions have issued earlier to make school computer labs ready, but however no progress in this regard. Therefore, the CLIXs team (TISS) came forward to make computer labs ready by hiring the services of technical persons from their end and also requested for the participation of MIS persons along with them to make all computer labs ready. • The equipment required to undertake the repairs have already been supplied to DEOs by the IT department and the material has been taken to the schools by CLIXs coordinators. However, if any additional material is required such as LAN switch, cables, Battery etc. The Head Masters shall procure the same from the market using the available school grants in the schools. Once the team visited means the lab should be ready for the use of teachers and students. • The District Educational Officers are directed to keep one of the Sectoral Officers of SSA as Incharge for this programme and the name may be communicated to the Commissioner & Director of School Education office and also to the CLIXs team. • The District Educational Officers are requested to visit one or two schools and observe the computer labs. 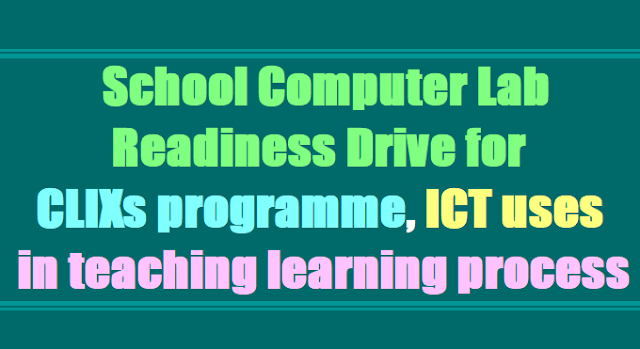 • The District Educational Officers are directed to issue instructions to the Head Masters to make use computer labs and use ICT in teaching learning process, improving students digital skills since the teachers of these schools have already been trained and access credentials have already been given to teachers i.e., User name, Password to use CLIXs software. The CLIXs team and state level ICT team shall be visiting the schools to observe and support the implementation. • The district wise and school wise dates for the visit of the CLIXs team to undertake repair is enclosed. Wherein the District Educational Officers have to depute the MIS Coordinator of that Mandal to the schools to participate with the CLIXs team in undertaking repairs. The District Educational Officers are also directed to allot the MIS Coordinators work to the next DTP Operator during the days of absence of MIS Coordinators and his work. Actual bus charges to the MIS Coordinators for visiting the schools shall be given from the available SSA / RMSA funds. The District Educational Officers are directed to take immediate necessary action in this regard and all school computer labs and must be ready by 3 .08.2017 without fail.